Hope – is a confident inner alignment, coupled with a positive expectation. However, there is no real certainty as to whether or not this desired outcome will actually occur. 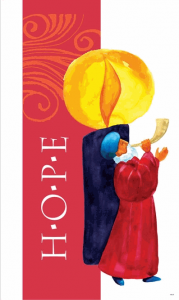 Hope is the comprehensive emotional and often action-guiding orientation of the people on the future. 1. 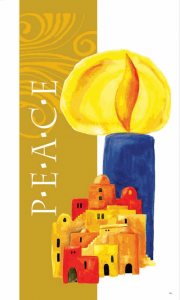 Sunday of Advent: PEACE be upon us – an eternal dream? In the first days of November of this year in many places in the world, people thought about the end of the first world war 100 years ago. „Never war again“ was one of the most cited appeals because people had gone through a war with unimaginable horror. Did they learn anything from that? Unfortunately not, because as much as the war and the violence was abhorred at that time, the actual causes have received very little attention. Immediately thereafter, demands for reparations, territorial claims, etc. were on the table, which only deepened the discord, hatred and injustice. In connection to this, you could consider the verse from Mat 5,39: “When someone strikes you on your right cheek, turn the other one to him as well.” A wisdom, which irritates us immediately. Why do I have to suffer the hurt twice and become humiliated to get peace? – Not a few will ask what is that good for? It is no different than a wisdom that the ancient Greeks had already recognized, namely that of amnesty. There it was prescribed by law and executed in all its consequence. What does that mean? What has happened cannot be undone, and we all know this from often painful experiences. The call and desire for revenge, retribution and (supposed) justice is strong. But how can one succeed in escaping this spiral of mistreatment, murder, manslaughter and ongoing mutual violence? This is a dilemma which is tormenting human history for millennia. In ancient Greece, it was recognized that a new, untouched page must become opened in the Book of Life. However, this can only happen if all the old “insulting and hurting” does not continue to burden. Therefore “general forgetting” – the amnesty, was prescribed by law. The violation or disregard of this law was made under penalty of death or synonymous exclusion from the society (outlaw = was left to fend for itself), the highest of all penalties. Thus, amnesty can be seen as a kind of prescriptive forgetting. This requires tremendous courage from people in terms of size and tolerance. This is often not easy. But only through this pain a new beginning succeeds, and a new, common life is possible. The Christian faith understands itself as a religion of peace. But what a contradiction do we see and read in the daily news? Today we celebrate the first Sunday of Advent. This should recall on the entry of Jesus into Jerusalem. (Luke 21,25–28.34–36). This report on this triumphal entry is a contrast program. But these contrasts show us examples for use in one’s own life. It is the story of a king who comes as a low servant on a donkey, not in royal robes, but in clothes of the poor and the humble. Jesus Christ does not come as an earthly king to conquer by force, but with love, grace, mercy and his own sacrifice for his people. His kingdom on earth has no armies, riches, or splendor, but humility and servanthood. He does not conquer nations or markets; he does not want to dominate anyone. No, he invites and speaks to the hearts of the people, His message is that of peace. Every peace always starts on a small scale, in ourselves, no matter what the external circumstances may be. Every peace begins or ends where the boundaries between me and my neighbor are crossed. If there is disunity within ourselves, it usually reflects outward in our words and actions. Sooner or later, this inner “war” leads to external strife. That’s why it’s so important to be in peace with yourself, “to functioning smoothly”. I cannot ask for something from others that I am not prepared to give from myself. Friede sei mit Dir …!